Last year was my first time keeping a list for my bird watching, although I didn’t get serious about really adding variety to my observations until part way into the year and I’d combined it with my desire to improve my photography skills. My personal set of rules were that the birds must be photo-documented, and they must be living, wild birds which were not restrained in any fashion. I ended with what I felt was a respectable 56 species for 2013 following these self-prescribed guidelines. At the end of last year, I decided I would need to up my game for 2014: 100 photo-documented bird species seemed a heck of a goal for someone relatively new to birding and list-keeping. I wanted to aim for getting out as much as possible, exploring different locations each weekend (weather & other commitments permitting), and continuing to focus on my photography skills. My list grew rapidly. In fact, much more quickly than I had anticipated. Summer activities slowed me down for a few weeks, but with the onset of cooler autumn temperatures and the arrival of fall migratory birds, it picked back up recently. BirdFest out at Ridgefield National Wildlife Refuge seemed a promising time to reach my goal, but I was left at #99 (a great horned owl). The Birds & Brew event in Forest Grove on October 11th seemed like a fantastic opportunity to get my elusive 100th bird and celebrate afterwards. The first of two guided tours that morning was my target, as were the freshly baked cinnamon rolls. (Bird nirds gotta eat.) I had been unaware that the latest phase of restoration to the wetlands was some serious construction, and that the ponds were completely drained to allow for this; it was a bit shocking and worrisome so far as birding opportunities go. Still, the Dabbler’s Marsh trail was open and it is one I had visited earlier in the year with great success. Spirits remained hopeful as the group set out. It took only minutes for my goal to be reached, and it was not – as I had worried it may be – some super common bird I had yet to photograph, like a rock pigeon. (I’m still not sure how I haven’t managed to snap a picture of one, to be honest.) No, this was a bird completely worthy of my lofty number: the common raven. Oh, sure, the name says common, but these are not birds which frequent the area. 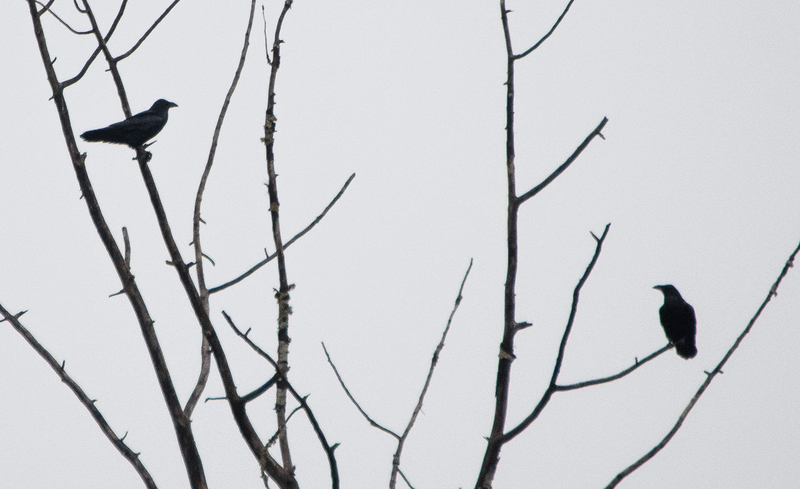 They are in fact rare in this part of the state, and on this foggy morning we saw four of the huge black birds. Now, these may not be my finest photographic achievements, as the birds were in motion most of the time they were in sight and also at quite a distance. So distant, in fact, that even with the guide feeling confident they were ravens, I came home and immediately pulled up my pictures so I could confirm they weren’t simply American crows. There are some important distinctions between ravens and crows, and my worries were soon dispelled. 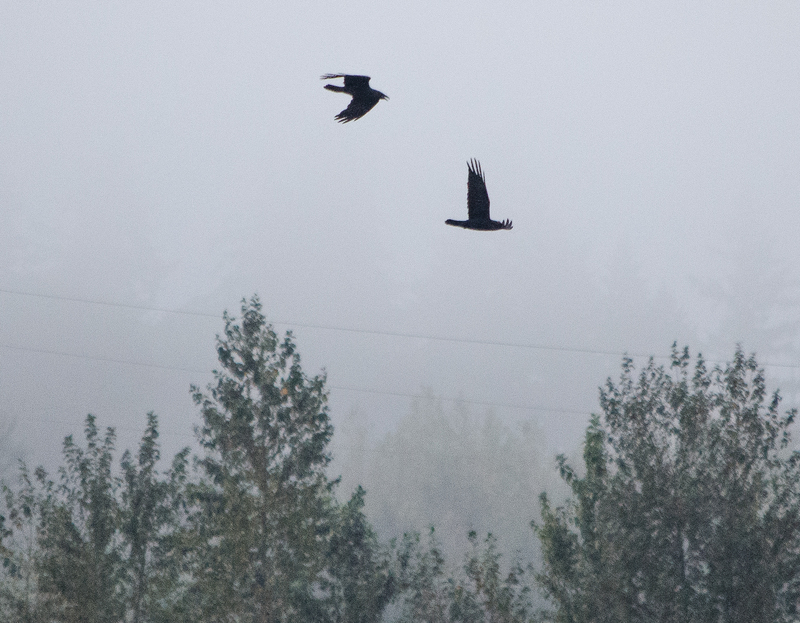 The common raven is larger than the American crow, but due to the distance I hadn’t been positive of their size. Ravens have a wedge-shaped tail, whereas the crow’s tail is rounded. Also, ravens have four “finger” like feathers at the end of their wings compared to the crow’s five. Lastly, the beak of a raven is much larger proportionately than that of a crow. These were certainly ravens. 100 species photo-documented! 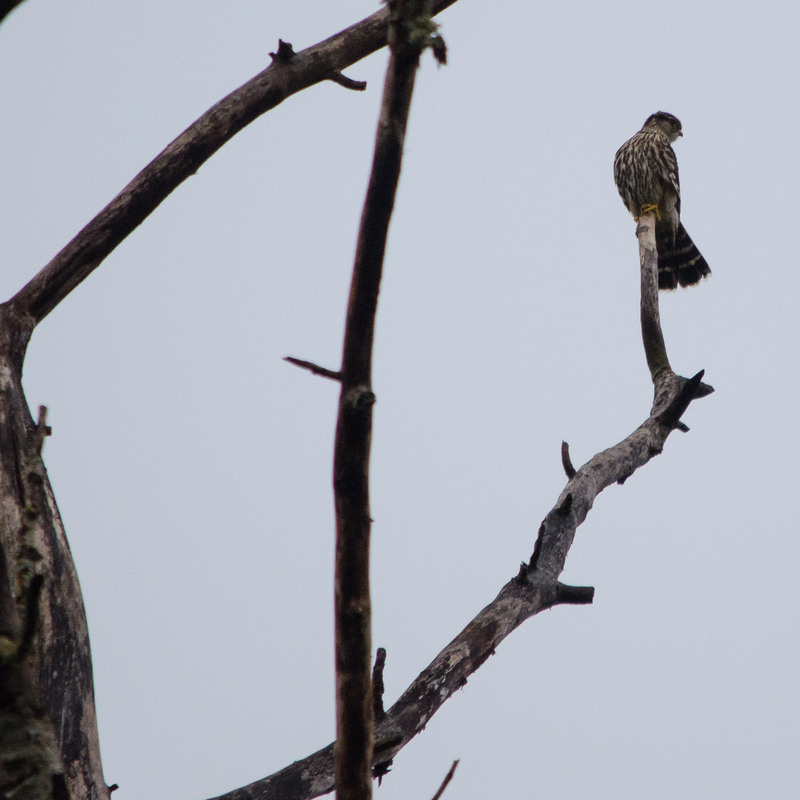 As an added bonus, I nabbed bird #101 while on this little trek as well: a merlin opted to perch above the trail and preen for a few moments, despite the group of noisy humans clamoring for a look at him. 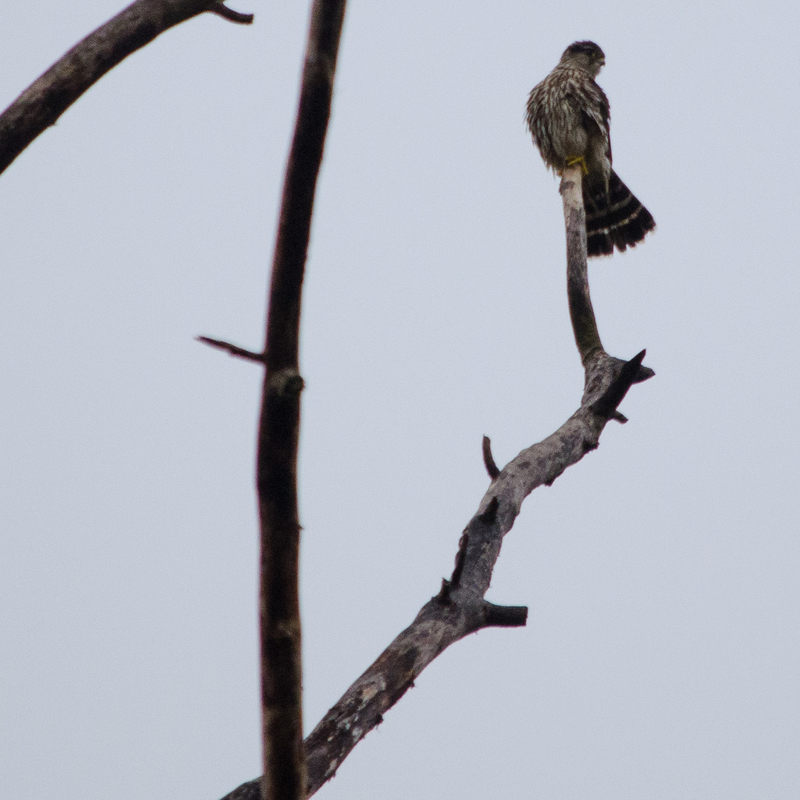 He almost seemed to pose, fanning his tail and stretching one of his agile legs out, puffing out his feathers despite the drizzly morning weather. 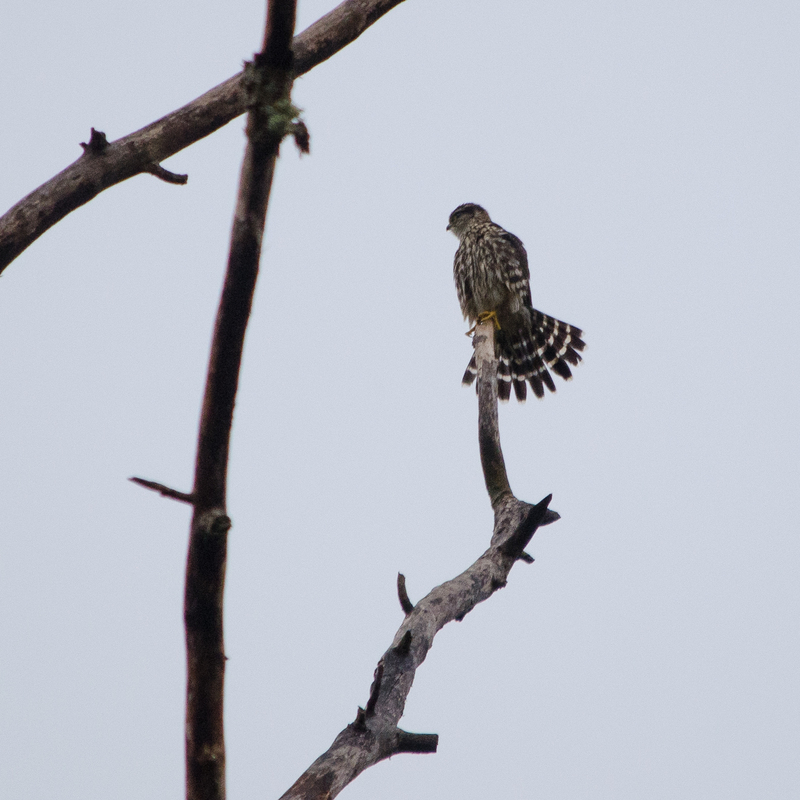 And then the small raptor took off, and left us to finish our walk through the marsh. Along the Dabbler’s Marsh trail, we also saw and heard song sparrows, golden crowned sparrows, bushtits, black-capped chickadees, red tail hawk, bald eagle, cedar waxwing, Canada geese, great egret, great blue heron, and killdeer. You couldn’t not hear the killdeer. Clearly the construction at this site is not deterring the birds from visiting. Oh, and for the record, the 100th bird was in fact celebrated with brunch and a tasty brew. Cheers!